The field of marketing has dramatically changed over the past 15 years due to the advent and dramatic proliferation of the Internet. Roles like social media marketing, activities like search engine optimization and tools like marketing automation platforms didn’t exist until the early 2000’s. Some didn’t really become mainstream in business until about a decade later. There is a new technology trend that will dramatically revolutionize the marketing function once again. I’m referring to Artificial Intelligence. I am writing this article (in early 2018) because of the increasing certainty that artificial intelligence (AI) in its various forms is finally going to take hold for a whole host of business functions and use cases. Functions that are already advantaged by advanced analytics and adaptive learning are especially ripe for innovation and disruption via AI. The specific aspect of AI that offers the most promise to many business functions is machine learning. Machine learning provides systems the ability to automatically learn and improve from experience without being explicitly programmed. In other words, it uses vast amounts of data to learn and automatically adapt towards a desired result. Until the mid-2000’s or so, marketers could mostly rely on following a model referred to as the “4 P’s of Marketing” (product, price, place, promotion). I wrote an article recently that introduced the “New 4 P’s of Marketing” because of how outdated the original 4P’s seemed. The Internet changed almost everything for marketers. Over the last couple of decades the field of marketing has gotten more and more analytical and metrics-driven. It started with optimizing websites for search engines and has continued with the introduction of email marketing, social media marketing in its various forms and all aspects of inbound and digital marketing. This is exactly what machine learning AI is optimized for, only it does it very rapidly and with little or no human intervention. Yikes! Wow! Kaboom! Currently, we optimize our marketing activities campaign by campaign. The inputs needed and the outputs analyzed are different in each case, which makes optimization a somewhat tedious task. Over time we tend to gain tribal knowledge of what generally works best and we often overly rely on this knowledge to assume it will remain true over time. Unfortunately, we live in a very dynamic world and that renders the assumption less true that most admit. Some might claim that AI tools already existing for the marketing department. While I admit that’s possible, my strong prediction is they are mostly deep analytical tools and don’t really meet the definition of “machine learning”. But that statement will progressively be outdated after I publish this article in early 2018. You get the idea. Today we do this campaign by campaign. It’s like I said before: predict, run, measure, refine, repeat. Interestingly, big companies further have to do this by geography and product line. Just imagine all of the possible combinations and permutations in the pursuit of optimization. Just imagine all of the time and energy that can be saved when artificial intelligence does most of this for us automatically. None of what I mentioned above is going to happen overnight but I do believe we are talking about a short number of years, not a decade, for marketing tools with embedded machine learning to take significant hold inside of businesses. The more the business already relies on digital marketing and marketing automation, the faster AI will infiltrate. 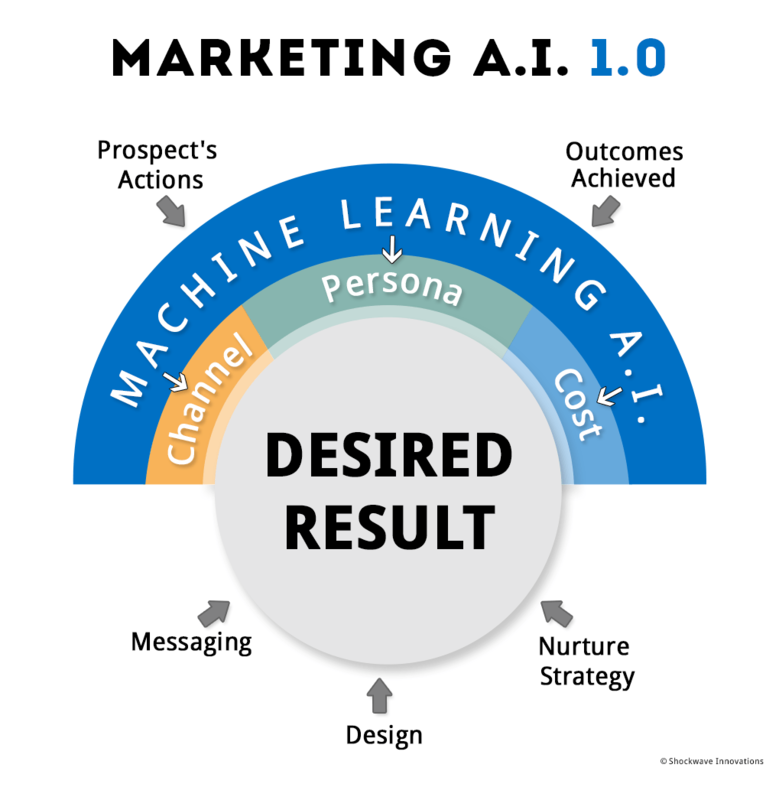 Later in this article I predict the macro-level evolution of marketing-focused AI into what I describe as AI Version 1.0 and AI Version 2.0. But I’d like to start by predicting the impact to various marketing roles and functions. Some roles will be significantly enhanced by AI while others will be completely eliminated from the org chart over time, in my opinion. Let’s explore a few. As described above with various examples, people with this position currently have a lot of analytics available to review after a specific campaign or major program is run so they can tweak and tune for continued optimization. Soon, the tools will do that automatically. Someone will still need to decide on the objectives of the program/campaign and the ideal target audience. Someone also needs to develop the content or narrative “copy” for things like emails, social media posts, a landing page or whatever. Might some of this even be handled automatically with AI? Prediction: These roles will evolve into program and campaign STRATEGY roles instead of EXECUTION. We will not have marketing programs managers or marketing campaign managers. Instead, we will have marketing strategists. Depending on company, this role can have some of the same responsibilities as marketing programs/campaigns – but usually for an assigned geography or vertical segment. Any sort of digital campaigns they execute will follow the same trend as mentioned above. Prediction: This role will evolve to mostly focus on local events (seminars, shows, lunch-n-learns, etc), which are typically part of the responsibility today. But even those events will be decided with input from AI tools to help ensure the best outcomes. Very little time will be spent doing digital programs and campaigns because that will either be centralized or AI tools will do most/all of the work. We will still need people to manage the systems that will increasingly incorporate machine learning AI. The validity of the data will remain critical and maybe even more so with AI. Dashboards and reports will still be needed so that the marketing strategist, business managers and company executives can see what’s going on. So in that way, the marketing operations role will remain very important. Prediction: This role will either evolve in the direction of a data scientist or I actually believe we will end up with two roles – one to manage and administer the system itself (operations) and another that is responsible for the underlying data structures and ML algorithms (data science). In the time horizons I suggest further below for AI 1.0 and 2.0, the following marketing functions seem to be less affected. Brand Management – It occurs to me that brand management will be much less affected by the evolution of AI. PR & Publicity – This function should benefit from AI helping refine press release messaging and selecting ideal influencers and communication channels. However, pitching a conference organizer for a speaking slot or an editor for a story seems to require human-to-human interaction for a long time to come. Product Marketing – This function will certainly benefit from pricing optimization, buyer persona characterization and competitive intelligence. But it doesn’t seem like those things will cause elimination of the product marketing role. The top marketing officer has always had one question whose answer has been the elusive holy grail of the marketing function: In order to accomplish the company’s business objectives (usually revenue targets), how much money should be spent on marketing and exactly what things should it be spent on? In my article titled “Optimizing Demand Generation Using Portfolio Theory” I gave a glimpse into what this could and should look like specifically for demand generation marketing. But the concept of portfolio theory for the entire marketing function has always been a holy grail. We are currently enjoying this level of AI in the marketing field. It means that many different marketing tools are already incorporating advanced data analytics for pattern matching, recommendations, predicted outcomes, etc. In addition, some are starting to incorporate machine learning for continued optimization. But, again, the lightweight AI capabilities are tool-specific, which also means they are campaign-specific. Nonetheless, we are already getting a taste of AI’s potential. As hinted at with AI 0.5 and just as with the evolution of the Internet, use of AI in business will evolve in a way that we actually won’t notice it month-to-month or quarter-to-quarter. But if you went to a deserted island without connectivity and lived there for even 3 years, you would return to a world with a fairly transformed marketing function. And if you decide to hang out on that island for 6-8 years, you would later barely recognize the function as “marketing”. 1) Input a desired business result for a specific campaign type. For example, 1,000 new freemium-to-paid conversions to the $29/month app within the next 90 days. 2) Review 2 or more possible approaches with associated channels, predicted costs and odds of success for each. 3) If one looks acceptable, click the RUN button and the rest happens auto-magically with updated results and predictions along the way. I believe this will happen by the middle of 2020. In this 1.0 world, humans will still need to decide on the ideal messaging, design and nurturing strategy. 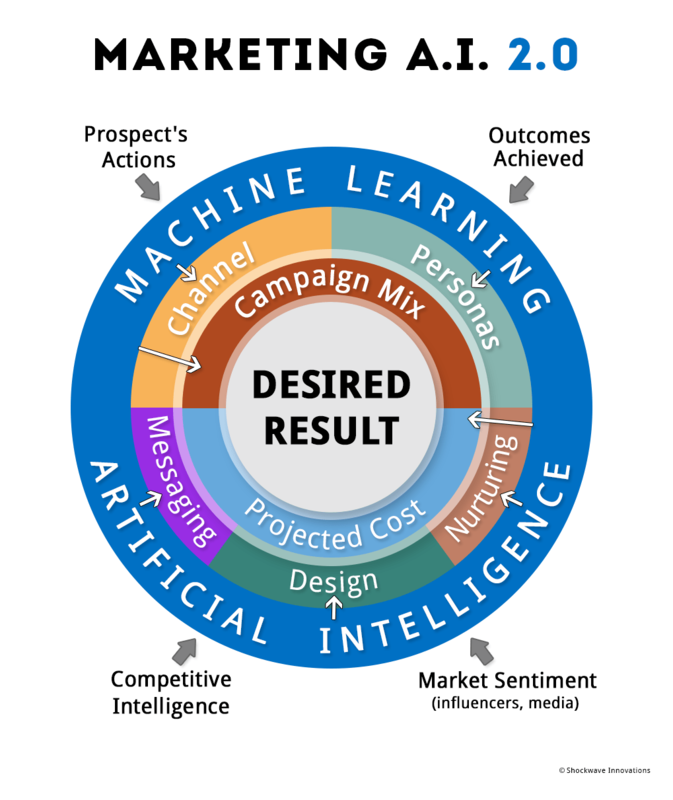 But the actions that are taken by the prospects and real-time campaign results automatically feed the AI algorithms as they automatically optimize for the predicted outcome. I also believe the 1.0 world will offer dramatically improved insights and understanding of a given prospect’s position in the customer acquisition lifecycle or buyer’s journey (ie – early stage versus late stage consideration). We do this today by evaluating the actions they take and content they consume. AI will use similar inputs but do a much better job at a very granular level (prospect by prospect). Ability to identify and characterize numerous buyer/user personas based on actual behaviors. In fact, there will be so many that we won’t call them “Victor the VP of IT” or “Meagan the VP of Marketing” like we do today. Instead they will known by the AI system as GB35487, MU45387, etc. (Drum Roll Please!) Ability to optimize the portfolio of possible marketing campaigns to deliver optimized, integrated marketing programs. 1) Input a desired business result for an integrated campaign. For example, $1M in new revenue from the upcoming product launch over the next 6 months. 2) Review the projected cost to accomplish the result with extremely high odds of certainty (ie – 90% or higher). 3) If acceptable, click the RUN button and everything happens auto-magically unless the algorithm detects new inputs (competitive factors, market sentiment changes, etc) that cause the objective to not be achievable, in which case the marketing strategist will immediately be notified. I believe this will happen by the end of 2022 and with significant milestone capabilities in this same direction every quarter starting mid-2020. Notice that in the 2.0 world, competitive intelligence of various sorts as well as detected market sentiment from both the media and key identified influencers become additional inputs to the AI algorithms. With these predictions for the 2.0 world you can probably see why I suggested above that various marketing roles will either disappear or be dramatically changed. The purpose of this article is not to engage in the debate about whether AI and robots are going to take over the world and eliminate humanity as we know it today. Instead, as you can probably tell, I do feel it will have a dramatic effect on the way marketing is performed today for many companies. Chief Marketing Officers and Marketing VP’s of mid-sized and large companies must start educating themselves about AI and should get ready to experiment with various tools that are pointed in that direction. If they don’t, startups and early stage companies that aren’t afraid of this type of experimentation and use of innovative tools will deliver them a crushing blow. Hint to Startups: If you hadn’t already realized it, hopefully you’ve just concluded that you’re about to be delivered another unfair advantage against your large competitors (the larger the better because they are typically most resistant to change). And if you don’t know about your existing unfair advantage, read my article titled “One Unfair Advantage All Startups Have Against Big Companies“.